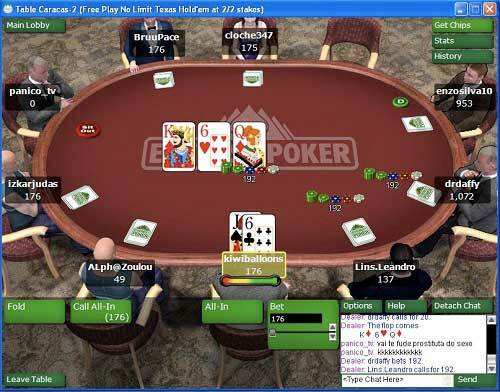 Everest Poker Bonus: No Code Needed for 200% up to €1,500 Free! There are no bonus codes or promo codes necessary to claim your bonuses at Everest Poker. Once you make your deposit, your bonus will be ready and waiting for you to earn it. Make your first deposit at Everest Poker today to qualify for a 200% bonus up to €1,500. You’ll have to earn Summit Points at the poker tables to unlock portions of this bonus. For the first €5 of bonus, you’ll receive €0.50 of the bonus for every 5 Summit Points. Next, you’ll get €0.50 in bonus payouts for every 10 Summit Points you generate for the next €15 of bonus. Finally, the balance of the bonus will be awarded to you at a rate of €0.50 for every 20 Summit Points accumulated. In total, you will need to accrue 59,550 Summit Points to maximize the full €1,500 of free bonus money. You’ll have 60 days from your initial funds transfer to earn your bonus. Any uncleared bonus after this date will expire. Everest Poker has crafted a Welcome Package for its new customers, which consists of the welcome bonus as well as other goodies. As a new depositor, you’ll receive €10 in tournament tokens, 20 Rewards Points and an entry into the weekly €2,000 freerolls. Recall that the first €5 of bonus will be granted to you at a rate of €0.50/5 Summit Points. The second stage of the bonus gives €0.50/10 Summit Points. The remainder of the bonus will pay out at a rate of €0.50 for every 20 Summit Points earned. In total, over the entirety of the €1,500 bonus, you’ll be achieving an overall cashback rate of 20.77% while raking $8,508. This number will change somewhat depending upon the currencies of the tables or tournaments that you choose to play, but your actual cashback percentage should be close to this figure. In particular, it seems that dollar tables are shortchanged a little bit at Everest, so your best bet is to clear your bonus at the euro tables, which will allow you to achieve a cashback rate of perhaps 25%. You can track your bonus progress via the bonus tracker in the poker client. You can earn the entire bonus at SNGs by playing 4,254 $20 + $2 SNGs. If you decide to instead play 100nl full-ring, it will take more than 160,000 hands to do so. Check out the number of games you’ll have to play at different game types by referring to the chart at the right of this page. Again, you will do better by focusing on games denominated in euro because of the way Summit Points are awarded. As you can see, this €1,500 bonus is not for the faint of heart. You’ll have to put in quite some time at the tables to clear it all before your 60 days runs out. 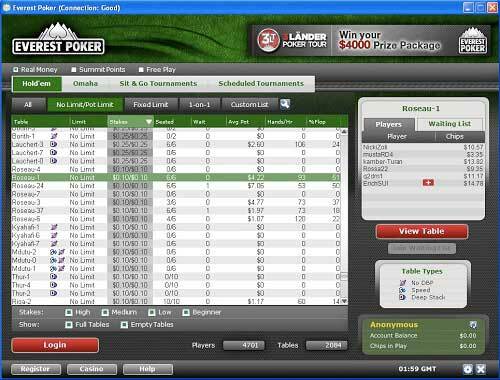 However, the €.50 incremental payouts are some of the smallest to be found at any online poker site. Thus, even players at the smallest of stakes will get frequent bonus pieces. All those Summit Points you earn while clearing the bonus don’t just sit idly in your account. Your level in the Everest VIP Rewards program will depend upon your Summit Point accumulation, and you’ll also receive Reward Points for every Summit Point you earn. As you ascend the 10 levels of the VIP program, you’ll get more and more Reward Points for each Summit Point you pick up. You can trade in your Reward Points for cash and for entry into special tournaments. At level 10 of the VIP Rewards program, you may be able to achieve rewards approaching 50% of the rake you’ve paid. Clearly, this VIP scheme should be a serious consideration in the mind of any dedicated grinder.